We haven’t discussed my third job before. Partly, because a lot of the work is confidential. I do an intense form of conflict/dispute resolution funded through government agencies. During these sessions I can be called upon to deal with property rights, harassment, bullying, emotional isolation, interpersonal conflict, issues of hierarchy, review boundaries, trouble shoot teams and deal with accidental and personal injury claims. Any number of issues come up, my role is to resolve them as many of them as possible, but with the brief that the satisfaction of both parties is the paramount consideration. Not for the faint-hearted? Too right, being a lunchtime supervisor in a primary school certainly has its challenges. In interviewing me for the role, the line managers talked a lot about how important it was for the conflicts to be resolved satisfactorily, so the children could come back happily after lunch and learn. I came out with this highly inappropriate remark (hard to believe, eh?). I casually said; “The thing is, it’s the same few children every time.” The interviewer did pull me up on this, saying of course we didn’t want to stigmatize children. So, during the rest of the interview I sat daydreaming, wondering what on earth I’d been attempting to express. What I’d meant, was almost the opposite of what had come out (why does that happen so often). I’d actually meant that while the school wanted conflicts satisfactorily resolved; that’s seeing them as short-lived acute problems. The children who were repeatedly problematic, suffered not from a lack of discipline, but from more chronic playground problems. They were, in my experience, unable to learn from the conventional social and discipline structures in place. Hence they, the repeat offenders, defied a system that they were largely unaware existed. What we would call, “playground behaviour norms” is actually news-to-them, each and every time they find themselves in confrontation with those expected “norms”. What this means is, the same kids get into trouble for the same things, all the time. Now, these kids might be described as aggressive, anti-social, lacking in boundaries, undisciplined, etc etc etc. These are the kids who answer back when an adult speaks, or worse still, continue speaking over that adult. These are the kids who sit outside classrooms and occupy the upper echelons of the excluded list. For example, on my first day in the playground, a 10 year old boy squared up to me, face to face. He was taut with tension, and fists up and clenched he threatened to punch me. (Luckily, he chose to attack an 11 year old boy standing next to me me, so I was ok everyone). Sounds bad? Well, this is not Tower Hamlets, this is not Hackney (sorry Tower Hamlets and Hackney you’re a cliché of your own distress now). We are not in area of extreme social deprivation, for god’s sake we’re in David Cameron’s idyllic Cotswold safe seat. We have free parking, Waitrose, and an immigration influx in the school of three middle-class Polish kids, who speak fluent English. Poverty round here means privately-owned, council houses. (Dear Maggie, she taught him everything he knows). So, what exactly is happening in the playground? We’re back with the ole 80:20 rule. Hate to say it, but yes, 80% of playground conflict arises from about 20% of the children. But, the million dollar question is; who makes up the 20% of the badly behaved. 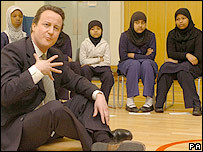 In the school I’m talking about, it’s primarily the special educational needs (SEN) kids. Yep, the kids who see the world a little differently to the rest of us. The ones who don’t have very good interpersonal skills, are literal rather than literate; who don’t know how to manage their emotions, deal with conflict, cope with change, tolerate being teased, who can’t stand still and listen at the same time, or know when to shut-up because an adult is speaking. Now, I’m not saying that there aren’t massive problems of discipline in schools in other areas, I’ve heard about it too, knives in school and stuff. But, I am saying that the figures are skewed by the special needs kids. I think it’s also worth mentioning that special needs kids are not always formally assessed. So, many of the should-be SEN kids go without proper diagnosis, without proper support and the funding for Learner Support that comes with it. They are failing in dramatic ways throughout the system. In the UK in 2011, children with learning difficulties, behavioural problems and other disabilities accounted for 66% all of exclusions. (National Association of Head Teachers website). The issue boils down to guess what? Policy. Yep, the UK policy for SEN moved house, out of specialist schools and into mainstream education inclusion. However, then the specialist budgets, resources, facilities, trained staff were not included in that move. It’s become a real problem in our educational system. All too many schools suffer a lack of sufficiently skilled staff to deal with the behavioural and educational needs of the SEN children. (And let’s remember that individual learning plans take time to write and time to teach – they’re called “individual” for a reason). If you’re interested, then there is a fascinating 75 page report by the University of Cambridge, Faculty of Education; commissioned by the National Union of Teachers, called “The Costs of Inclusion”. It describes the burden teacher repeatedly face trying to discipline and educate children who they are simply not trained to teach, handle or restrain (in some cases). The one-size-fits-all approach to our education system, handed down from on high with Government and Ofsted glaring over the schools shoulders can often be another contributing factor. These children are not able to meet the marks required by the outside assessors. This is especially hard if they have not had a formal SEN assessment. In these cases, they can been seen as the failures in the system, because without a formal SEN assessment, no allowance is made for their grades and achievements that takes into account their actual abilities. No, they might not achieve a level 4 SAT exam, but they may have made profound leaps in their own educational spectrum. If they don’t make the mark (set from outside the schools) the schools can suffer downgrading. If those with a SEN assessment exceed expectations, the schools can lose the additional funding for Learning Support Assistants, which are then seen as no longer needed. Rock and a hard place for the schools, children and parents. So, back to the ten year old threatening to hit me. He was with a group of well-behaved middle class boys in the year above. They were complaining about him freaking out at them. The had slightly hidden smirks, clearly, winding him up in subtle ways that he couldn’t cope with. He didn’t know how to express it, how to diffuse it, so he exploded and laid into one of the group, a boy I know well who, I do not consider a bully. If you look at this in terms of those conventional playground norms, we’re discussing, then yes, SEN kids was the aggressor and for threatening me alone, he could have faced suspension. But, I think we can all see who was really under attack here. It wasn’t me, or those able boys “having a laugh”, but clearly the child who would have faced the worst consequences for his “inappropriate” behaviour. This is how our exclusion and permanent expulsion rate is climbing in normal schools in the UK. These are the background stories explaining how staff are (sometimes) attacked by children. There are of course areas of great deprivation where it’s a different story altogether. But that’s the one that gets the glare of media attention. The majority of playground/school violence is not all done by 7 year old, knife wielding, sociopaths, selling heroin in the playground. I couldn’t offer you a better final sentence than the closing lines of the Costs of Inclusion Report. Although profoundly unaware of the real world around him. This young man eventually got a job (requiring constant supervision).